We headed south towards Cookeville TN on Friday morning and with a stop in madison WI to pick up the first crash mat in the USA, we had no time to spare. Who am I kidding we never have time to spare! Some ten miles before the exit my truck decided to blow a coolant line and overheat which brought us in even later than we were already. As soon as we set foot on the grounds we got to work setting up and prepping for practice. 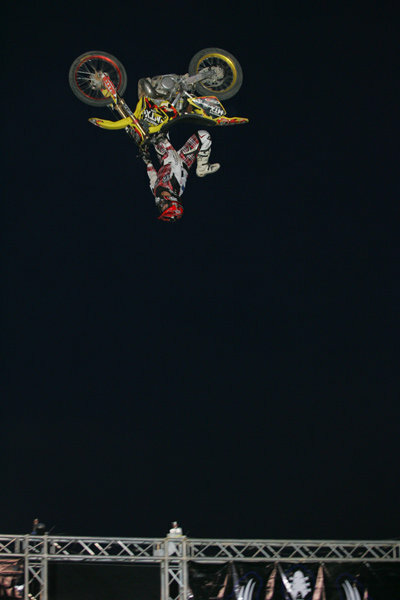 Once practice was over and our gap stretched out, we had to jump into show mode. It was an unusual show format as we would ride and a half hour off for music. 12 stones played! It was awesome to jam with one of my favorite bands! Anyway it was layed out like a comp and I had to go up against an old friend Cody Elkins. I remember doing one of my first shows with him back in 02' and he killed it then just like he kills it now! Like myself Cody is riding a 450 thumper and does very well on it. The crowd noise was the judge and after our first run Cody took the victory by a slight margin. I didnt mind as I had other things to set up for my double flip! Josh was set up against Doug Cossey and again the crowd was hard to read as they liked both riders efforts.In the end I really needed Josh to help set up for the double flip so He had to kinda lay up. 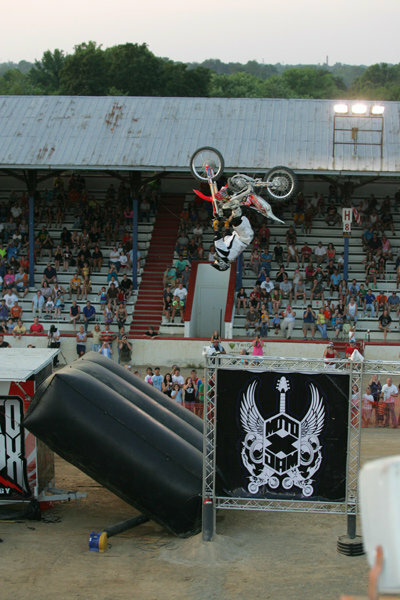 He didnt like it too much but still had the biggest upright tricks at the show! 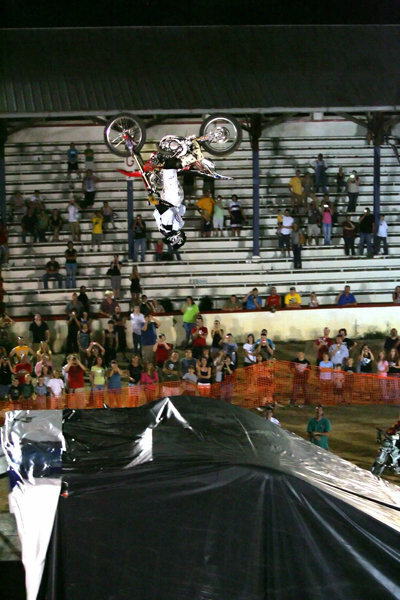 Then of course the likes of Chuck Coruthers brought out some big flip tricks and with his texan charm and a swarm of ladies in the crowd , he took the Moto X Jam crown for 2010. Chuck is an awesome guy to ride with and hang with. You would never know him to be an X Games Champion. After a long day and hard work setting up our new crash mat, which was simply raw foam covered by a tarp, It was my turn. here is a group of pics to show wat happened. I know I have the double flip dialed as anyone. my pad wasnt finished and when I stuck the bike into it, it was like having the brakes locked up and over the bars I was sent. very frustrating. I had a second try with similar results. 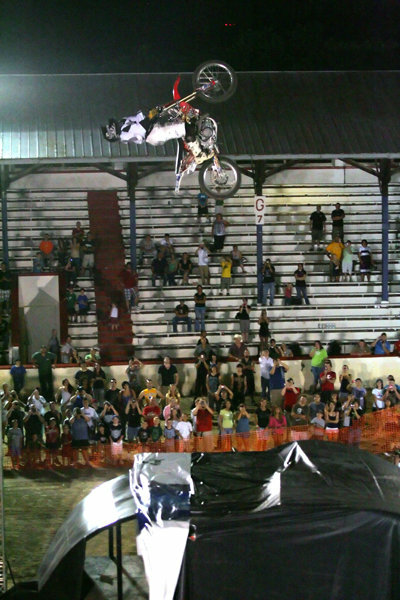 To date I am still the only person in the world to crash a double back flip and get back up. not something I am extatic about but a fun fact. So that is the show in cookeville tennessee. it was a grueling two months leading up to it and my credibility is fine. Maybe not to alot of people in this industry but to my self and my family and to my fans. I do what I say I will. I am trust worthy. Anyone who wants to argue about my abilities is free to have a go at it. Thanks to all the riders at this event for being positive and having a guys back. Looking forward to the next try!